Intersection of Hope and Doyle Streets. Image from Google Street View. The girl was hit by the car around 8:30 a.m. at Hope Street and Doyle Avenue, according to Lindsay Lague, a spokesperson for the police department. She was riding a rented Jump Bike, Lague said. Lague said the girl suffered “minor injuries to her leg” and was transported to Hasbro Children’s Hospital. This incident happened on the first day of a school bus drivers strike in the City of Providence. I think your supposed to be 18-years-old to rent a JUMP Bike. We may be hearing more about this later. Also, the City has been reluctant to approve bike lanes on Hope Street. what about the driver of the car? also this is likely to show the need to slow down in urban driving, especially in school hours and especially with the schoolbus strike. I hope PVD police are enforcing speed limits strictly. 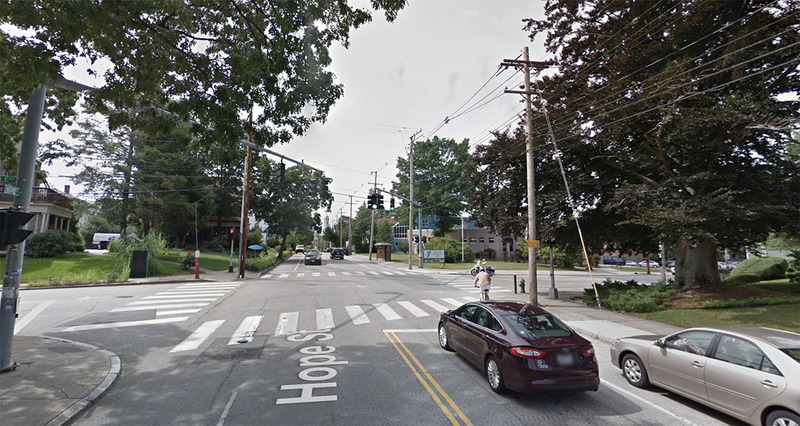 Not a great example in that Streetview image, but the right parking lane on Hope heading southbound into the intersection is generally treated as a de facto right turn lane. I’m not implying this played a role in the crash, because I don’t know, but it plays to the unpredictability of drivers at this intersection. It’s about time one side of Hope’s parking gets striped for bikes from at least Thayer to Lippett. Both sides are not needed.